The most beautiful thing about living in such a wonderful place as B.C. is the instant access to the mountain ranges all around us. Anywhere you go in this fantastic province there are hiking trips, outlooks, mountain lakes, glaciers, crystal blue waters and places you can go where the whole world seems below. You can head to Whistler or Blackcomb, Squamish and the Sea to Sky Gondola, Grouse Mountain, Cypress Mountain, Hemlock, Manning Park, Sun Peaks, Silver Star, Big White, Kicking Horse Mountain Resort, Yoho National Park or you can charter a helicopter to take you to any mountain peak you would like for a truly unique view that nobody else has for the wedding photos. Take an adventure and bring along your custom Vera Wang gown and David & Sherry will trek with you every step of the way taking wonderful photos and mountainous landscape images for you to hang on your walls. We love capturing what we call our Couplescapes with flowing dresses and veils of brides and grooms who don't mind a hike to get to where we need to go. We will often use the method of hiking in proper attire and keeping the good clothes in the backpack before arriving at our location, putting on our high heeled shoes, dressing in our wedding gown and tuxedo, and taking beautiful pictures with stunning landscapes. We would be happy to join you on your mountain adventure wherever in the world that takes you. 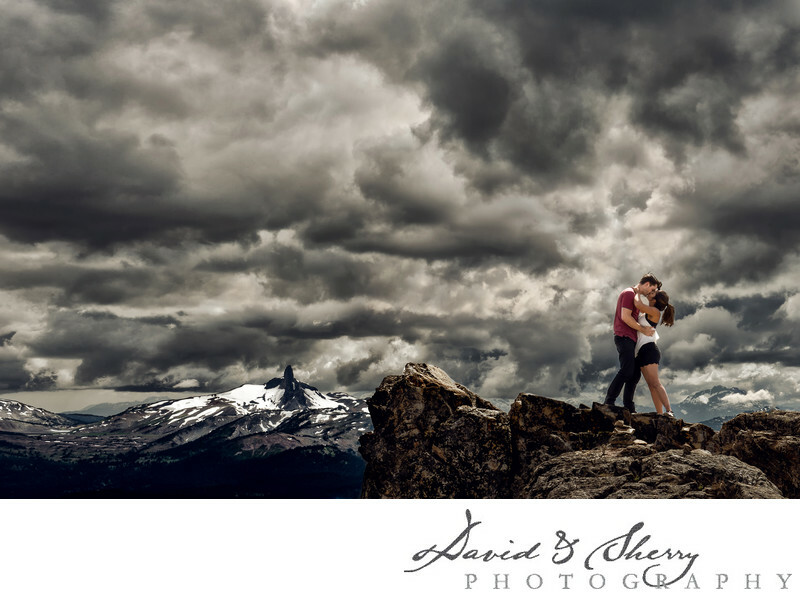 David & Sherry photograph weddings across Canada without travel fee.